Technical cycling jersey made with a high wicking fabric that will keep you dry and cool on summer riding. threee traditional back pockets with a zippered bonus one to hold your cards. The mesh under arm strategically place for maximum ventilation, elasticated wait, silicone hems to stop The jersey from riding up. Reflective piping on back increases visibility on night riding. Anatomic fit cycling jersey with lightweight fabric. Extra length on back would cover your hips comfortably on bending position. The silicone strip on jersey hem stop it from riding up. The standard three pocket design with an extra zippered one. - Super lightweight, breathable Micro-vent fabric used on front and back panels. High elastic A153 Taiwan Jonestin (the same performance like Lycra) on side panel, sleeve and collar. 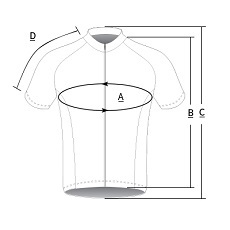 give you a comfortable and breathable race cut cycling jersey. - Form fitting: Snug fit in accordance with ergonomics. - Polyester Jacquard mesh under arm: Super breathable and durable. - Italy Soft elastic tape on sleeve cuff: high elastic, anti-skidding and comfortable. - Three independent rear pockets + zippered waterproof middle pocket: convenient to stock food. - Hi vis reflective piping on rear pocket to increase night riding. - Anti-skidding epoxy brushed elastic string on the whole jersey hem.